Still mesmerized by the beauty, decay and opportunity that Transfiguration Church is beginning to represent. More to follow. photo courtesy of Sean Galbraith, Toronto. While checking out the Buffalo River Wednesday afternoon, Ohio Street canoe launch, I spotted the Lansdowne again that's currently berthed at BIDCO. Forgot camera, sorry folks. 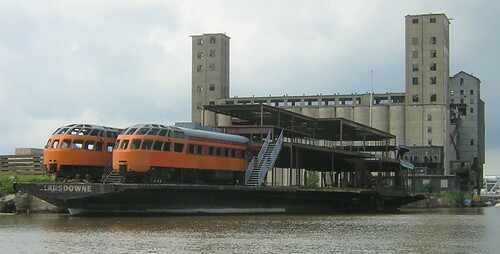 The first pic, from September 2006 canoe trip, Part I and Part II - shows two rail cars, converted once to a restaurant in Detroit and later submerged in Erie, PA...used to look a bit different. Chip from Rochester, NY - regular fixBuffalo reader - sent in the other picture recently, how these rail cars looked, back in the day. The cars (there may have been 10 or 12 all told) were built by Pullman in 1947 for the Milwaukee Road's "Hiawatha" passenger trains, which ran west from Chicago to Minneapolis & Seattle. 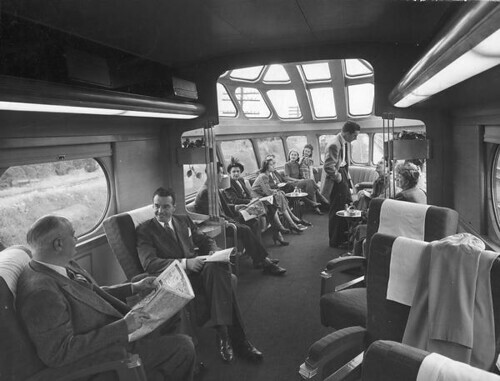 This was the Milwaukee Road's equivalent of the New York Central's 20th Century Limited; luxury accommodations. In the 1960's, as US rail passenger service was in decline, the Milwaukee Road sold a number of the cars to the Canadian National, which used them into the 1990's on overnight passenger trains operating between Montreal & Halifax. Been down to the river a few times this year always different. McArthey's - nearby, great place for lunch or Friday nite fish fry. Live folk music Friday nights, too. And what trip to the "womb of Irish Buffalo" wouldn't be complete without visiting Mazurek's Bakery! Every Saturday...if weather's bad, just come on by the Sonic Café and we'll chat about the neighborhood. Newell and the BuffaloRising crew were great to include a post this week about a recent tour. Regular 11am Saturday morning tour of the neighborhood - Backyard at Artspace. Meet-up in the Sonic Café area and plan on walking down Coe Place, around Ellicott, Northampton and Holland Place and Dodge if we have time. Plenty to see and learn about in an hour. While talking about various developments and issues here on the City's near East side, we'll be stopping along the way to take pictures of the amazing amounts of architechtural detail. I'm always seeing something new. Make sure the batteries are charged in your digital camera, cup of coffee and we're off for an hour in what is soon to be Buffalo's coolest new neighborhood. Saturday's at 11am...e-mail me or just show up. Here's the map! Working on back patio - yes, Preservation Board approved - and a few other outdoor projects while the weather still holds. If you haven't already downloaded Firefox 2.0, you really should. FixBuffalo and the rest of the web works best with it. Try it! And if you still haven't clicked thru Olga'sTransfiguration Church pics, here you go. Favorite spot is this view from the choir loft. This shot of an intact Joseph Mazur mural should remind all of us of the importance of rescuing this art before it's gone and forgotten. I mean, who is going to save Jesus? Blog free Wednesday, too probably...for Buffalo River canoe trip. Here's the posts from a few recent paddles - May 2005 and September 2006. Caught up with Newell as we ducked out of the public hearing at County Hall late Monday afternoon. I usually see this guy in the driver's seat shooting up the City with the BuffaloRising cam so we made some time and caught-up about the local 'sphere and some City stuff down at the Pearl Street Grill. While Newell has like totally perfected the art of driveby photography - I've got to come clean and with my own as I'm not always grabbing pics with my feet on the ground either. The urbanistically unique and design challenged Merriweather Library from the driver's seat. 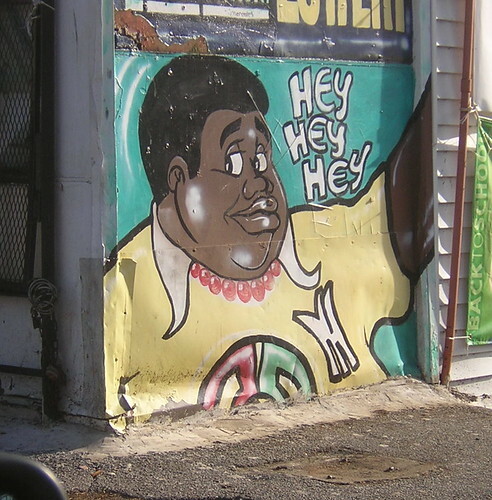 And some of my favorite street art, down on Dodge Street, too. Side view mirror in the way as proof. All time favorite is my blog free Tuesday photo - sandpilechild... Be on the look-out, you'll never know just when and where Newell will be...he's everywhere! I've been watching this one for awhile and just got the ML listing for 61 Glenwood Avenue from Ryan Pierce over at Polis Realty. 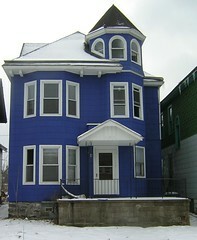 61 Glenwood is just a few blocks away from Artspace and around the corner from Performing Arts High School [quikmap]. I grabbed these shots Sunday afternoon. This 3/2 double appears to be in very good shape and recently received tons of love in the form of new vinyl windows, back porch and glass block windows all the way around in the basement. Looks like a newer roof, too. 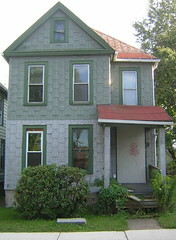 This is a bank foreclosure and Ryan can be reached at 716.881.1200 x209. He knows the neighborhood really well. And the bank only asking 14K. For comps sake, just a few blocks away 38 Northampton was on the market less than 60 days. And look at what you'll see from the front porch! Cool. Had a few people ask about the City's recent in-rem auction results last week. I was there last month for a short bit and saw some amazing action on one west side property and now live on a block here in Cold Springs where three more homes are owned by the City, too. First wrote about the results of what we here in the City know as in-rem 40, the city's recent tax foreclosure aution, right here in Mapping Foreclosures earlier in the month. Great gis mapping tools available in that post. 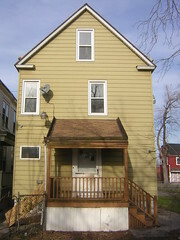 If you want to check out a specific property, I've organized the auction's results in an on-line and searchable spreadsheet - City of Buffalo - in rem 40. Chuck LaChiusa's Buffalo as an Architectural Museum has a link to Transfiguration Church, documenting photographically some of the amazing architechtural detail - here. He also links to a brief history of the church and parish development written by Joseph Napora. The Polish Geneological Society of NYS has another history of the church. Urbaneyes and others have reminded me of lower level green style re-development for places such as Transfiguration. 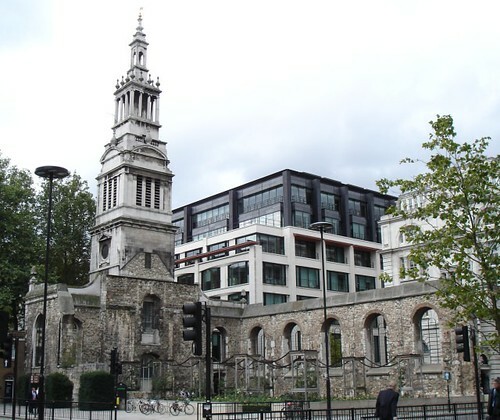 Here, Christ Church Greyfriar in London - once destroyed during the Blitz in 1940 - remains standing, in part as a City park and part private residence. The other bombed out church, still standing in Europe on one of my favorite streets, the Ku'damm, is Berlin's Kaiser Wilhelm Memorial Church. 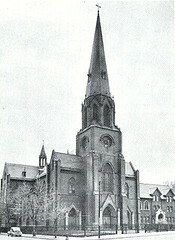 It was built during the same time as Transfiguration and destroyed in 1943. And considering Transfiguration's bombed out apocalyptic interior, we just might have two possible models, in lieu of complete demolition. Local ecclesiastical artist Joseph Mazur (1897-1970) is responsible for the creation of the murals that are now literally falling off the church's walls. Sean Galbraith from Toronto captured the condition of these murals recently with this photograph. Mazur is also responsible for a more secular piece - the Chopin Monument which was on the grounds of the Buffalo Museum of Science until it was removed from the East Side and to its current home in Kleinhan's Circle on Richmond Avenue. For additional back ground about issues raised here make sure to check out comments in my Journey to Avoid Housing Court - Part 3 from February 2006 and in David Steele's February 27, 2006 BuffaloRising post, A Peek at Heaven and Possibly Hell. It's only going to get worse in the months ahead for buildings such as Transfiguration. It's going to be pushed further to the back burner as Bishop Kmiec prepares to close additional architectural treasures, mostly on the City's East Side. Was reminded Sunday afternoon of an article distributed a few weeks ago at the unveiling of Blueprint Buffalo by Michael Clarke and the folks at LISC - Buffalo. In a recent issue of Governing Magazine writer Christopher Swope interviews elected officials and policy wonks about what's happening in Youngstown, OH. The result, a short article - Smart Decline - dealing with with various aspects of the planning/development conundrum confronting a shrinking city like Youngstown, OH. Two longer q&a's with the same article - one with Youngstown Mayor Jay Williams and the other with Hunter Morrisson, Director of Urban and Regional Studies at Youngstown State University. While the site - Governing.com - is full of useful planning and development material, the associated blog - 13th Floor - is worth a closer look. See also - Getting Smarter about Decline...includes links to Blue Print Buffalo. For those of interested in issues involving "brownfield reclamation" see Learning from Others. Make sure to check out LISC - Buffalo and National Vacant Properties Campaign for addtional information regarding issues and major public policy initiatives involving abandondment, vacancy and the management of decline. 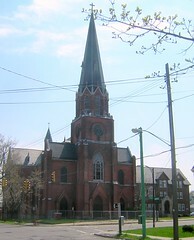 I visited Transfiguration Church on Sycamore Street a few times this past week. While urbaneyes and I rang two of the three bells still high in the belfry and spent considerable time marvelling at the extraordinary beauty of what remains of the church's interior - others were shooting. Jay Morrison of Toronto and Mat from the DK PhotoGroup were around. 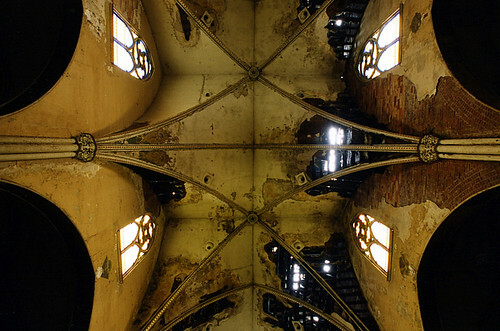 Jay's photo's - flickr slideshow - and Mat's - also, flickr slideshow - are really extraordinary and capture the unique beauty of one of Buffalo's most forgotten religious ruins at this moment in time. Olga was around, too. Check out her work - here, on livejournal. Inside Transfiguration, finally...contains references and links to the sale of this church and recent Housing Court history. Sean Galbraith's work - another DK Photogroup member - is featured in that post. Amazing, bookmark the page and pass it around. Still wondering how things like this happen. I mean the City's most progressive housing court advocate, Judge Nowak - probably in the history of Buffalo - has never seen the file on this building in his court room. Get this, in three years - index #869/97. And Common Council President David Franczyk, who lives just around the corner from Transfiguration Church - is silent and has spent more time trying to save Perrysburg - you just won't believe this - than he has in his own neighborhood. Oh, almost forgot, there's a Polish Bishop here in Buffalo, Bishop Kmiec, too. No Polish heartstrings to pull on this one. Strange, I know yet the storefront church directly across the street from Transfiguration is in significantly better condition. Would love to listen to my favorite Mahler, Symphony #2 - Die Auferstehung, feet up in the choir loft here at Transfiguration sometime, soon. Way appropriate especially considering which poet Mahler embraces for inspiration on this one. The Art wing was framed in this week. In the banner sketch right here the new Art wing is on the far right. The BAVPA flicker photo archive provides a quick review of the past 150 days construction progress. See BAVPA Reconstruction Archive for additional details and updates. BAVPA - flickr photo archive. Taking a few days off. Couple day trips and some work around the house. Reading and preparing a longer piece about the work of Camilo Vergara, too. Here, Hodderson focuses his attention on the brownfield reclamation efforts in the heavily industrialized area of the Ruhrgebeit in Germany. This area is better known as Emscher Landschaft Park. A few additional links illustrate many of Hodderson's points. The slide shows are very easy to navigate and will provide a good visual orientation to the project's scope. I spent some time Sunday afternnoon cruising the bibliography of both parts of the report - Policy Brief and Action Plan - and realized that the .pdf version wasn't hyperlinked [full text - Blueprint Buffalo-Action Plan]. So rather then hunt and peck for them, thought I would include them here, as they appear in the bibliography. Here's the (almost, rest in a few days - check back) complete list of websites mentioned - archived here. 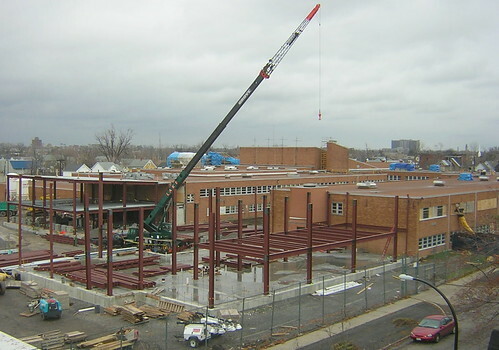 The last of three additions - the new Art Wing - began taking shape this week with the erecting steel structure. Lots of early morning clanging steel construction happening here. Make sure to check with BAVPA Alumni/PTO for additional details about what's going on. Cyburbia is a constantly evolving site. Excellent forums and plenty of opportunity for feedback and information about planning and development issues in Buffalo and beyond. Welcome to the Internet's most active urban/town planning-related bulletin board! Cyburbia Forum members include planners, students and others from around the world who are interested in the built environment. At the top of the pile right now is a post about HGTV - which I've written about before in a post called, Byron TV as a future episode relates to Artspace - and urban revitalization, right here. In June of '05 I posted this about the planned 14209 PO re-location in the forum section. Great responses that added significantly to the debate at the time. Consider joining or start lurking, today! The most recent e-Newsletter from Local Initiatives Support Corportation (LISC) just arrived. Very interesting election analysis as results will impact urban planning, housing and various land use issues. Conference announcments, too! The eNewsletter is richly linked. Check it out here - November LISC eNewsletter. I've archived it here, in the new LISC-archive. While talking about various developments and issues here on the City's near East side, we'll be stopping along the way to take pictures of the amazing amounts of architechtural detail. I'm always seeing something new. Make sure the batteries are charged in your own digital camera, cup of coffee and we're off for an hour in what is soon to be Buffalo's coolest new neighborhood. I fell in love with Coe Place more than 10 years ago. A good friend lived on Coe - urban planner, bicycle mechanic, voracious reader and bread maker - introduced me to Paul Theroux and re-affirmed the importance of V.S. Naipaul's critique on various global issues - and reminded me of the importance of establishing a sense of place. He helped me see the street and neighborhood's potential despite the neglect and struggle and did all of this at a time when I needed it most. 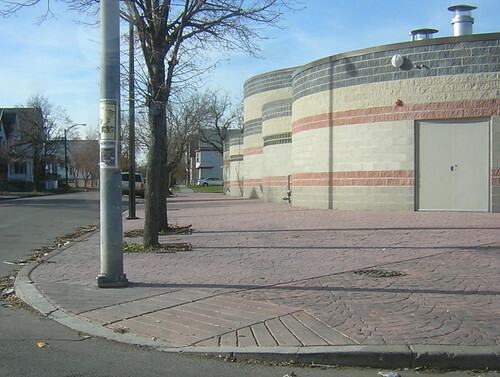 It so happens that two of the most exciting and pivotal projects in the recent history of Buffalo were conceived and are beginning to appear at the same time - Artspace and Performing Arts HS - sort of sister projects that present a unique promise of re-establishing the City's near East side. One near Coe Place and the other across from my spot in Cold Springs, just a few blocks apart. 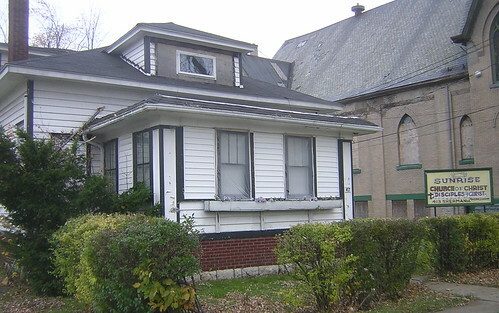 The City's Preservation Board has already agreed to help block the demolition of 28 Coe Place. I'll work very hard with anyone who has a plan, probably about 30-40K in financing to turn the place around. Let me know. Geoff Kelly has a nice piece about Tuesday's action on Coe Place in the most recent issue of Artvoice called, Sleeper Cell! Mark Odien, from WNYmedia.net dropped by after midnight for an interview. Here's his post and the Youtube video - very cool Mark. Thanks. Gabe has Chained to Coe up over at BuffaloRising. The important thing now is to find someone who wants to make 28 Coe Place home. Stop by and take a look! Thank you to everyone who stopped by to say hello the other night. Nice socks for my toes, spicy cider from Coe Place neighbors, awesome clam chowder from the Sonic Cafe and mozzarella sticks from BK. I attended the public release of Blueprint Buffalo - Regional Strategies and Local Tools for Reclaiming Vacant Properties Thursday afternoon at the Larkin Building. The report contains a critical assessment of existing institutional and public policy initiatives. The study examines strategies used in other weak market cities that experience the abandonment and vacancy that is becoming increasingly more common place in post-industrial cities like our own. The Blueprint Buffalo uses James Q. Wilson's work as a point of departure. 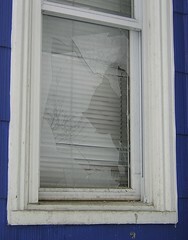 ...if the first broken window in a building is not repaired, then people who like breaking windows will assume that no one cares about the building and more windows will be broken. Soon the building will have no windows...read the rest, 2/13/06 Wide Open...Only in the 'Hood. 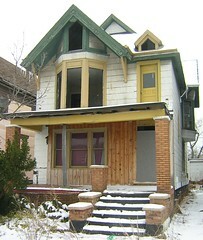 Two houses on Woodlawn Avenue, opposite the new Performing Arts High School seem to illustrate Wilson's critique. Buffalo Fiscal Stability Board member and treasurer, Rev. Richard Stenhouse's organization owns the property on the right. The City of Buffalo, the one on the left. Pictures are from February 2006. 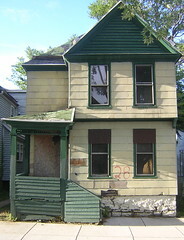 I first learned about the National Vacant Properties Campaign, in February 2005 shortly after I started blogging - right here. The Buffalo News first mentioned the emerging work presented this afternoon in October 2005, that I'd previously archived, right here. I followed that up with this post. I've been fortunate to have had numerous discussions with Michael Clarke (LISC-Buffalo) during the past year and recently developed an on-line correspondence with Lisa Schamess, the project's writer/editor. We have to get smarter at handling decline, fast. I've mentioned the emergency medical strategy of triage numerous times while thinking and writing about vacancy, most recently here - Heartbreak in the 'Hood. We can't save everything. We have to become smarter and more strategic in how we handle housing and land use in Buffalo. A comprehensive inventory would be a good first step towards getting our hands around the issue. Thinking about the City as person - borrowing from the ancients who knew a thing about politics and the soul somewhere in Greece - if the patient is bleeding to death, doesn't make much sense treating an in grown toe-nail, does it? One of my conversations with Lisa recently included a humbling exchange between the personal and larger political (community wide) issues. Bottom line - that was echoed today - it's very easy to deny that abandonment and vacancy is happening. Dealing with these issues on an individual basis is hard, on a collective basis, perhaps impossible. Yet if we don't get smarter - like cutting our losses and begin land-banking - who will? It'll be more difficult next month and next year. Apologize for the recent lack of posting. Dealing with some sort of seasonal flu thing and haven't been doing the overnite positng. Back in top shape in few days. Lots of stuff piling up updated demolition pics here in Cold Springs and shots of a very unique arts instiution in the Fruit Belt that has managed to slip my radar until recently. A few new additions to My Vinyl Collection - more Vergara and a recent find in my own neighborhood - the coolest late 19th C. horse stables and carriage house that I've somehow missed these past 10 years. Join Us on Coe Place...Tuesday Afternoon! Today Eliot Spitzer, Governor-elect, arrives in Buffalo, NY for the first time since his resounding win in New York State last week. In the spirit of reform that he has promised on the campaign trail, housing activists across Buffalo will be focusing Mr. Spitzer's attention on the shadows, the places no one wants to see or help - in a meaningful way - alleviate and change. As Eliot Spitzer visits Buffalo to celebrate the victory of his reformist agenda, residents of Coe Place in Buffalo and other concered citizens from neighborhoods across Buffalo will begin their effort to save two historic properties from the vicious neglect of a state agency--the MBBA--charged with helping streets like Coe Place turn around. Neighborhood residents will be joined by members of community groups including PUSH, friends and readers of Fix Buffalo Today, local preservationists and Michele Johnson - East Side Housing Advocate to initiate a housing "strike" against the agency and to demand action by Governor-elect Spitzer and Mayor Brown. The action will begin at 5 PM at 28 Coe Place. Housing Strike on Coe Place - Full Text Press Release! The Brown administration has failed to respond to 1500 problems created by an agreement inked by the City of Buffalo and MBBA. Two of those problems exist on Coe Place, which I've written about recently - here. PUSH Buffalo and others are helping to organize an action on Coe Place Tuesday afternoon at 5pm. 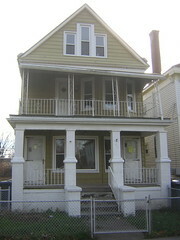 Please join and explore ways we can shake these two houses - 28 and 39 Coe Place - from the callous grip of MBBA. Our sincere hope is to engage Governor Spitzer, upon his return to Buffalo, in a meaningful dialog about reforming the agreement between MBBA and the City of Buffalo. There are at least 1500 reasons why he would want to. Additional MBBA information - right here • MBBA in Buffalo - link to spread sheet listing 1500 properties • Coe Place Archive. An amazing amount of work has been accomplished this past week. The Science Wing is taking shape and the new Art Wing has a concrete floor that was just poured. Walked around the school on Saturday afternoon and snapped this pic of the new main entrance on Ferry Street. Will have some fascinating shots of the masonry work taking shape at the new main entrance later this week. A very high level of craftsmanship happening. Very nice work. People often ask me, "So, you really think this building can be saved?" Two words roll off my tongue. Granite Works. It's my mantra. Transfiguration would have been one hundred years old this year and was a featured stop of the recent Tour dé Neglect. I've stopped thinking about trying to save Transfiguration. Now, it's a protracted battle over who is going to front the demolition cost. Tax payers or local attorney? And get this, the guy's mother has an outstanding Housing Court warrant, four years old. He named her president of the corporation. Wonder if she knows? Since starting in Housing Court, Judge Nowak has not seen the file in his court room. Really beginning to wonder why? It's a lost cause and sad reminder of the deep structural issues facing a weak market city with a declining population. Mix in some Diocesan malfaesance, a Council President living close by who supports Casino development while simultaneously abandoning the unique urban character of his Broadway Fillmore district's heritage buildings - remember the Wollenberg, burned down just six weeks ago - and a floor full of lawyers at City Hall working with an Inspections Dept. that can not seem to locate the responsible party (local attorney, living a few blocks away from City Hall) well, you get this, a photograph taken Sunday afternoon. Sean (check out his site, wow!) from Toronto's most progressive urban exploration and visual documentary heritage group - DK PhotoGroup - was in town with a few photographer friends over the weekend and went inside. Really zen about losing this one. It's the 400-500K demolition bill that Buffalo residents will have to fork over when the place is written up for an emergency demolition at some point that I'm pissed about. Bill, what say you? I'll be here, every Saturday morning. Just love your campaign slogan when you ran for Ellicott District Councilman a few years ago. DK's Orphaned • Saving Transfiguration • Imagine this? While searching out Vergara and photographing a few church buildings here in Buffalo recently, I've recognized an emerging pattern. Many of the churches Vergara describes exist side by side and next to older more established structures, places perhaps that may be traditionally described as, churches. Sometimes both structures appear as though they are headed towards ruin and lack the resources necessary for good maintenance. The Sunrise Church of Christ, here at the corner of Sherman and Sycamore [quikmap] is representative of this side by side sort of mix. Both buildings pictured here belong to Sunrise Church of Christ. No idea yet what congregations worshiped here prior to Sunrise's ownership. I first visited this church back in January of 2005, here and after a brief check of Housing Court records found that nothing was happening in court or with the smaller church builiding next door. I remember neighbors telling me that a few parishoners would meet occasionally next door at this spot in what I've assumed may have been the mance, back in the day as the congregation can no longer support utility payments next door. Here are three more views from June 2005. What's telling today about the neglect here is the tree limb resting on the gutter. The storm was a month ago and the limb is still where it fell that night. Like the tall grass you will see in front yards all over the City late in May and early June - places where no one cuts grass any longer as no one really cares for the property any more - downed tree limbs and branches resting on porches and front yards are quickly becoming the new markers of abandonment, decay and vacancy here in Buffalo, NY. Especially in places like this where no one goes anymore. Saturday's at 11...Begins This Saturday! HUD's 203K - What do you know? Coe Place & Block Club Meeting...Today!